McNutt is right on time, with this week’s Comic Review Friday! 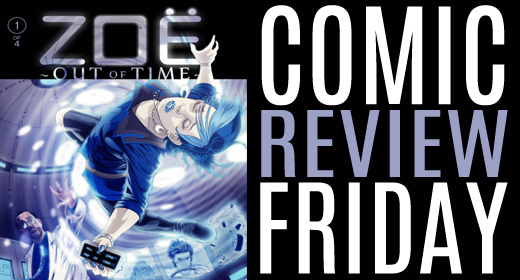 Zoe Out of Time is an exciting venture into the life of a futuristic punk teenager’s time traveling fantasy come true. Often when I first see time travel in a book, I become skeptical. More often then not, it only serves to weaken the book with paradoxes. Thankfully, Michalski and Lagos have weaved a story together, that even though is centered around the time traveling antics of an adolescences, avoids any of the typical down falls of a time travel story. I would even go as far to say that this book is not really about the time travel. Rather, it is more about Zoe’s discovery that her musical hero is not everything she dreamed him to be and her growth because of that. Oh, and she may get in some trouble here and there too. Zoe is an absolutely intriguing character. She is a punk rock girl from 2050, whose lifestyle is familiar enough to us today, but alien enough for us to recognize her futuristic origins. When her father reveals to her that he has created a device that will allow people to travel through time, of course, her first thought is that she could meet her musical hero Trent Darrow, who lived in 1990. Some of the most entertain portions of this book are the moments where Zoe is trying to deal with the differences between her time and 1990. Although, the book is titled after Zoe, I believe that Trent is the true star of this book, which is a testament to Michalski’s and Lagos’ writing abilities. He exudes star material, and regardless of his vices you cannot help but love him. It is not hard to believe that Zoe would be so enamored by him sixty years after his death. I really look forward to see how his and Zoe’s relationship develop over the next two books. The art in this book is phenomenal. I will admit, that I oftentimes ignore the art of the book, but I could not in this book. It really felt like Santacruz and Kramek were on the same page. The imagery and the colors blended together to really set the mood, while subtly enhancing the story, instead of distracting from it. Overall, Zoe Out of Time is a really strong book, that has built a lot of promise. Time travel and punk, even though an unlikely pair, seem to go together really well. If you like Back to the Future, there is no way that you will not this book. Its a strong showing by all involved, and I look forward to more from this team. I give it a four out of five stars. Issues 1 & 2 of Zoe Out of Time are available on Amazon; Issue 1 is available on Comixology.